Do you have a mannequin with a big crack on the face but is otherwise in good condition? Here are some ways to upcycle it give it a new FABULOUS life. These ideas came from The Creativity Window, a good resource for visual merchandising projects. 1 If you put a decorative mask no one will know that the mannequin has damage on the face. Halloween, Mardi Gras or Venetian Masks offer lots of options. 2 You can also attach flowers on the head to cover the damage and then repaint the mannequin a bright eye popping colors. We have a large variety of distressed mannequin in our “boneyard” at Mannequin Madness at discount prices. With a little creativity you can turn them into real works of art for your home or window. 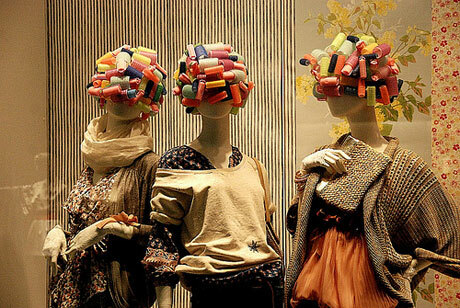 3 Another idea is to make a head dress on the mannequin using a variety of household objects – curlers for example. Or Xmas ornaments, leaves, feathers grass, twigs, hay, straw and many other free materials that are just available around. 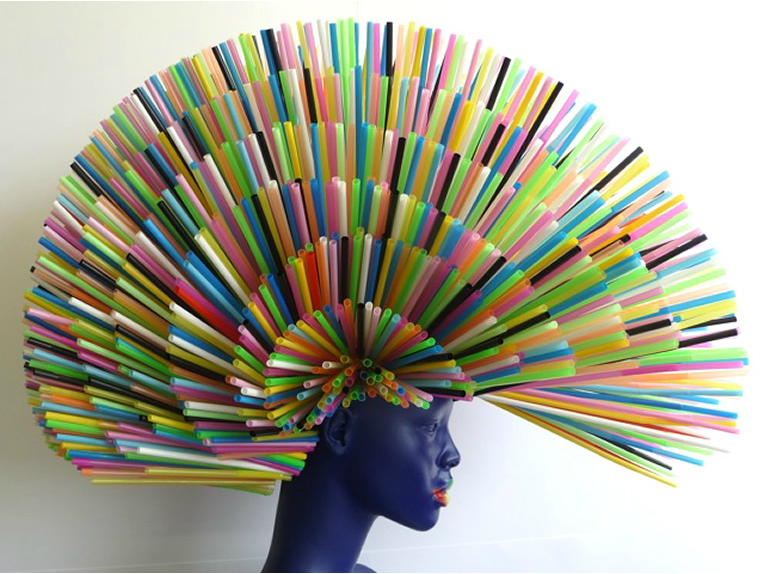 Recycling is also good idea to apply when making your personalized headdress. 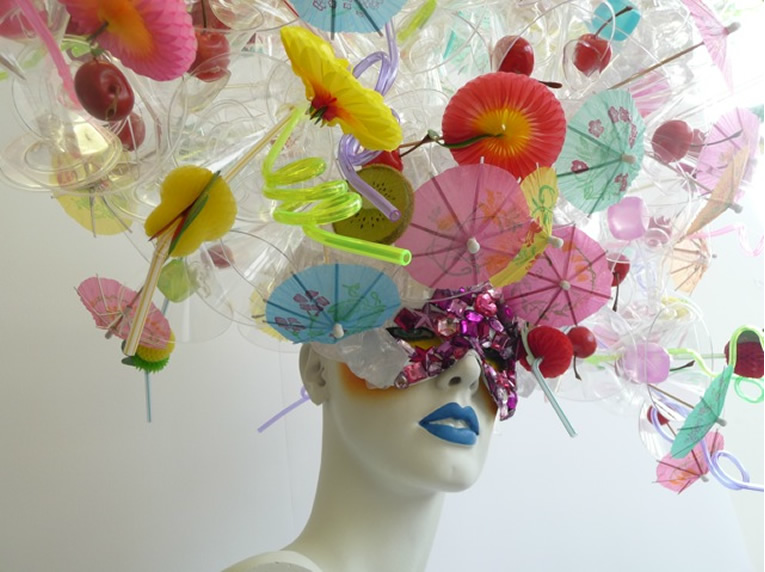 Here are 2 over the top examples of household objects turned into fashion pieces. 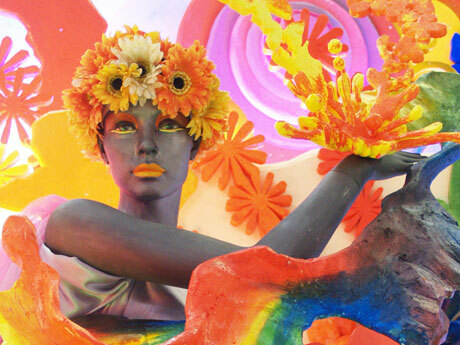 They were done by artist Zoe Bradley for Harvey Nichols stores in London. Needless to say, it takes special skills to create these headdresses. So you might not get the same result, but you get the general idea. 4 Another way you can transform the mannequin would be to use poster color or water color to cover the damaged part with decorative body painting. 5 You can recompose the parts and the pose. If your mannequin is manufactured to be standing, detach the waist and let it sit. If the arms are manufactured to be hanging down try to raise them up. Use some adhesives and other binding material to achieve this purpose. 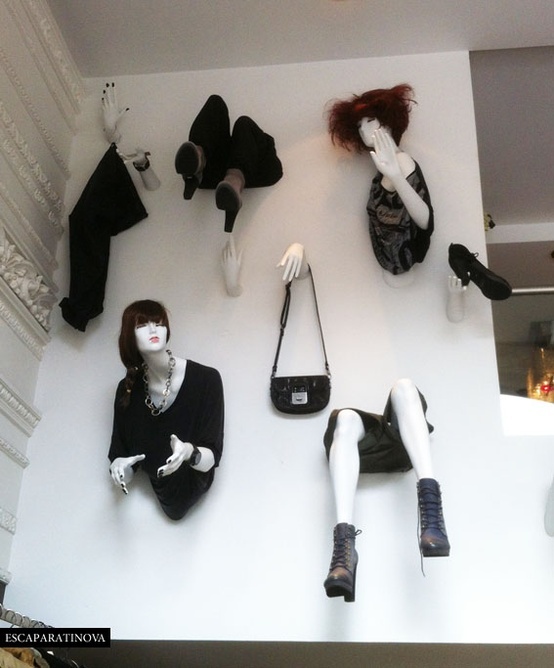 You can also use the mannequin limbs in creative ways like this one from Diesel.